Travel Penticton’s unique and exciting Youth Influencers program aims to create a new generation of tourism ambassadors, by getting our local grade 8 students directly involved in social media and digital marketing. Students are learning new skills, participating in a variety of activities and being given the opportunity to share their personal views and experience about our City. Penticton is one of just two cities in the world that sits between two lakes, Okanagan Lake and Skaha Lake. Lounging on golden sand and frolicking in crystal clear waters are part of our summer culture. Just listen to what some of our Youth Influencers had to say. Skaha Beach is my favorite place in Penticton. Skaha Beach is located on the south side of this amazing town. Turning 14 soon, I love to hang out here with my friends and family. This beach is definitely one of the most quite places in Penticton. There are so many activities that you can do down at the beach. There are many grassy areas with trees for shade, making it a great place to go for a picnic. There are a total of two parks; one is for younger children and one for older. They both have slides, monkey bars and swings. If you are into sports, there is a volleyball court and basketball court as well as a plain sports court for others such as hockey. Tickleberry’s has two concession stands at this quite beach. They have ice cream, candy, slushies, fries, soda and more. This Beach is so amazing because it is SO clean, full of things to do and super quite! Something that I really enjoy doing in Penticton is going to the beach. 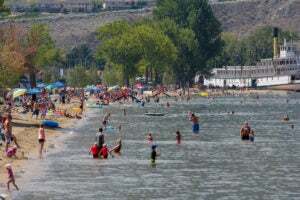 I usually go to Sudbury Beach on the Skaha end of Penticton it has a paddle board rental shop and it also has an ice cream shop with Tickleberry’s Ice Cream. That’s another thing you can do – you can drive to Okanagan Falls (10 minute drive) and go to Tickleberry’s main store. They have their own flavors of ice cream and a whole lot more, like fudge and a little gift shop and you can look and the murals on the outside with all the bears. I visited the Wibit this summer and it was fantastic. My friends and I spent hours and hours running, bouncing, slipping and sliding and when our time was up, we had so much fun that we had to go again. The Wibit is a huge inflatable bouncy castle like thing in the middle of the lake with tons of fun stuff. Including: the huge bouncy trampoline, the slippery running curve, the monkey bar swing above water, the big bag to launch your friend (that is if you weigh more than them), and finally the magnificent ice tower. Standing at a whopping fourteen feet the ice tower is a troublesome climb even for the most experienced climbers. The staff are always smiling and in a good mood. After paying your small fee, signing the waiver and finding the life jacket that fits you, you’re on your way to a great day on the Wibit. It’s that easy. I personally like living in Penticton because of the weather and the beaches. My family moved here last year from Northern BC and the beaches and weather had a big influence on that. Everyday this summer, my friends and I would go to the beach to have an awesome time. The beach is the perfect place to go swimming, eat ice cream, and get some vitamin D! The water is the perfect temperature to cool off from the sun and there are docks to have fun and jump off of. Plus, everyone can have fun at the beach whether your grandparents want to read a book, or your parents want to relax while you have fun. So if you ask me why Penticton – the beaches are definitely at the top of my list.